Could you elaborate on the Article One project? What are your plans for Hill Air Force Base? What are your thoughts on welfare reform? Senator Mike Lee held this live VideoForum to connect with residents of Davis County, Utah and hear about issues important to them. Senator Lee answered questions from participants and spoke on issues such as Article I of the Constitution and how Congress has gradually shifted away from it over the last 80 years. He explained that Congress has been outsourcing legislative power to executive branch bureaucracies. He also discussed poverty and how to help reinstate and reinvigorate the return to work concept for people who are on welfare. 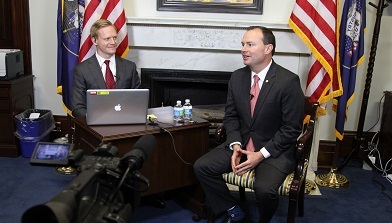 Senator Lee is a Constitutional Conservative and believes the federal government's power needs to be restrained.